A couple of years ago, scientists discovered an enzyme in a waste recycling center in Japan that digests plastic. During a recent experiment to understand how this enzyme works, scientists accidentally created a mutated version that breaks down plastic even better than the one found in nature. The discovery could go a long way in reducing plastic waste, particularly from water bottles. Progress in science is driven by very deliberate and calculated work, but every once in a while a happy accident occurs that enables us to take a major step forward. A new paper published in Proceedings of the National Academy of Sciences is a perfect case in point. 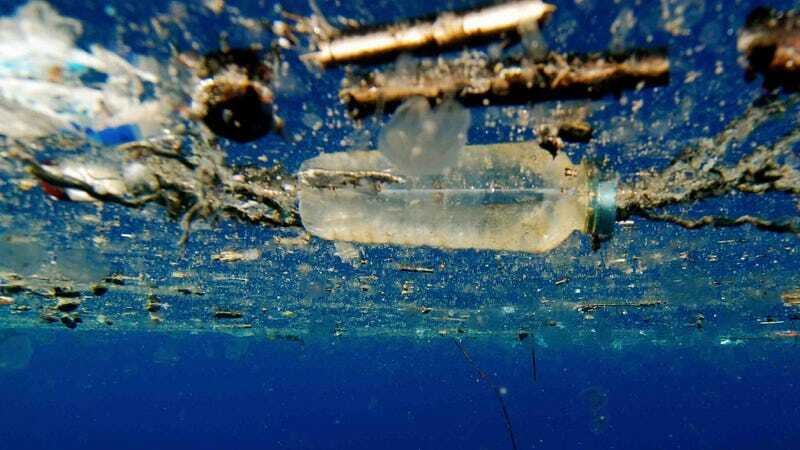 Researchers from the University of Portsmouth and the US Department of Energy’s National Renewable Energy Laboratory were conducting an experiment to see how a plastic-munching enzyme does its work (an enzyme is a chemical byproduct produced by living organisms). When they tweaked its physical structure, the scientists inadvertently created an enzyme that is 20 percent more efficient at breaking down plastic than the version found in nature. No doubt, since plastics first became popular in the 1960s, the waste produced by these products has gone from a minor headache to a throbbing migraine. Plastic waste exists practically everywhere, from landfill sites and state parks, through to ocean garbage patches and even the deepest parts of the sea. Millions of tons of plastic bottles, for instance, now litter the Earth, and they take hundreds of years to degrade. Finding ways to accelerate the degradation process has proved challenging, but the 2016 discovery of an enzyme that exclusively eats Polyethylene terephthalate (PETs)—the plastic found in water bottles—offered hope. This strange enzyme, called PETase, comes from the bacteria Ideonella sakaiensis, and it breaks PETs down to terephthalic acid and ethylene glycol in a process that takes days rather than centuries. Because these plastics have only existed since the 1940s, McGeehan’s team figured the enzyme evolved only recently, likely in the Japanese waste recycling facility in which it was found. For the new study, the researchers wanted to determine how the enzyme evolved and to see if it could be improved upon. Nom nom nom nom: An electron microscope image showing the enzyme (green) interaction with plastic (grey). Using the synchrotron at the UK’s Diamond Light Source, the researchers managed to solve the crystal structure of the PETase. This machine uses intense beams of x-rays that contain billions of times more photons than the x-rays that come from the Sun, allowing researchers to see the structure of individual atoms in three dimensions. 3D representation of the PETase enzyme. Illustration: H. P. Austin et al., 2018. To visually see how this enzyme interacts with plastic, the researchers modeled its newly derived 3D structure in a computer. They were able to see that PETase was visually similar to an enzyme called cutinase, which is found in fungi that infects plants. But it featured important differences, including an exposed active area that links well with plastics. To test the theory that PETase evolved in an environment rich with PETs, the researchers mutated the PETase’s active site to make it more cutinase-like. And that’s when the researchers stumbled upon their superior plastic-munching enzyme. In addition to being able to break down PETs, the researchers confirmed that the mutated enzyme was capable of digesting polyethylene furandicarboxylate (PEF), a bio-based substitute for PET plastics that could eventually replace some glass beer bottles. The researchers will now continue their work to see if the enzyme can be upscaled to industrial levels, and break down plastic even faster. Importantly, the researchers are hoping that a circular recycling system can be devised whereby plastic can be reconstituted back into plastic, easing the burden on plastic production and oil extraction. It may be a while yet before we see this mutated enzyme used at an industrial scale, but it’s certainly a step in that direction.